Empower your marketing team to be in complete control of brand assets so your sales team can focus on, well, sales. With FISION’s distributed marketing platform, every sales and marketing effort is streamlined for the Good of your brand. Empower Your People. Eliminate Waste. With FISION, you can eliminate obsolete and costly unused content. Our platform extends advanced distributed marketing capabilities throughout the sales funnel—giving your sales reps direct access to the assets and templates they need to engage their audience via e-mail, print, social media or web in a matter of clicks. And since each user has a unique set of permissions, marketing and sales can rest assured that everything is up-to-date, on-brand, audience-targeted and channel-appropriate. On average, 75% of marketing assets created go unused. Sales reps either cannot find the material or it’s out of date. With FISION, it’s that easy to leverage marketing assets across any channel, anytime by any sales rep, anywhere in the world. Provide field sales reps with the latitude they need. Instant access to templates and assets with the right amount of editing power helps them deliver the right message faster and on-point. Our distributed marketing platform allows reps to access, create, order, send and archive content that already has the thumbs up from corporate marketing. 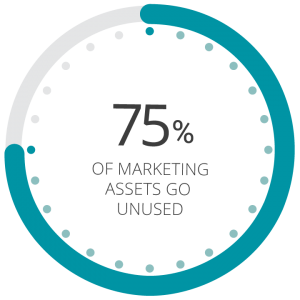 On average, 75% of marketing assets created go unused. With our collateral builder, there’s no need for one-off requests, potential off-brand collateral or lengthy approval processes.